When I viewed "Iron Man 3" earlier this year, I was a little nervous how the rest of Phase Two would play out. While I thought the third Iron Man movie was good, it didn't start Phase Two with the bang "Iron Man" did for Phase One. "The Avengers" was groundbreaking, and everything leading up to it was ambitious as hell, but Marvel pulled it off. Setting up Phase Two and keeping its fan base interested was going to be tricky and even more ambitious. The ball got dropped a little bit with "Iron Man 3" and I think Marvel fans collectively held their breathe, waiting to see how "Thor: The Dark World" would play out. Some of the early reviews liked "Thor: The Dark World" but it wasn't the shock to the system that its predecessor was. Well, I've seen "Thor: The Dark World" and I enjoyed myself the whole time. Is it better than "Thor?" Honestly, I don't know yet. I will revisit "Thor" sometime this week to decide which is better. I can honestly say though that "Thor: The Dark World" works better as an overall sequel compared to "Iron Man 3." The action sequences are gargantuan, bombastic and much better in "Thor: The Dark World" than in "Thor." Chris Hemsworth is much looser than ever before. We are beginning to see big glimpses of Thor's world and that is really exciting. Asgard as a setting is much neater looking, with a more medieval tone that I missed in the first film. The world-building Marvel has pulled off so far is truly remarkable and every actor is at the top of their game, easily outdoing themselves from their first outing. The sequel takes a much darker turn but nothing that was out of whack with its rating. In my theater, adults and children alike were having a heck of a time. We learn that before Earth and even Asgard, there was total darkness. We learn that that darkness lead to the birth of the Dark Elves. As the other realms were created, the Dark Elf Malekith (Christopher Eccleston) deemed all other races weak and wanted to return all of existence to darkness. Malekith plans to do this by using Aether, a powerful energy fluid which created the darkness, on the night of the Convergence, a rare night when all Nine Realms are in alignment. Malekith's plan was thwarted by the Asgardians and it lead to more than a thousand years of peace. We then move to present-day and after 5,000 years, another Convergence is imminent. On Earth, Jane Foster (Natalie Portman) and Darcy (Kat Dennings) are researching strange gravity pulls when Foster is mysteriously transported to an unknown realm and she somehow unlocks the Aether. The Dark Elves sense it and plan to continue with their old plan. 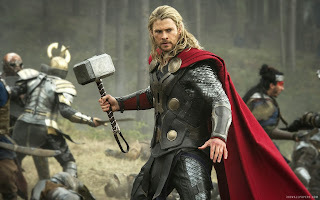 Thor (Hemsworth) plans to stop the plot and will eventually need the help of his brother, Loki (Tom Hiddleston). Like I said before, Hemsworth is looser than ever before. He has perfect comedic timing, obnoxiously-good charm, and the charisma of a God. I also got to say that Portman and Hemsworth have a very believable romance. Never once does it feel daytime soap-ish, it always feels real. Ray Stevenson, Zachary Levi and Tadanobu Asano are once again, great as the Warriors Three. I was impressed how much Kat Dennings didn't annoy me as Darcy. I was also very much surprised by how funny Stellan Skarsgard's Dr. Erik Selvig could possibly be. Rene Russo had much more of a character to play this time and she really nails it. Her transitions between loving mother and battle-strong queen were handled with ease, and I think many people will be very impressed with her work. The one thing I couldn't stand was Loki. Don't get me wrong, I love the character and I love Tom Hiddleston. Once again, he does memorable work. My only problem is I think he's a bit overused. I understand that Loki has become a fan favorite in the MCU, and Hiddleston's charisma is hypnotic. But this sequel would have been much stronger overall if Loki's part was dimmed down. We barely get to know Malekith and his partner Algrim (Adewale Akinnuoye-Agbaje), they never become fleshed out character, and that's just a waste of both Eccleston and Akinnuoye-Agbaje. We also loose a lot of time with Odin, The Warriors Three, Sif (Jaimie Alexander) and Heimdall (Idris Elba) all for a familiar sub-plot. After two movies, we get that Loki and Thor have a conflicted relationship, we don't need more of the same. The world of Thor is so rich and the possibilities are endless. But I guess Hollywood can't help but cash out on something popular. Loki is a great character, but use him in small doses and utilize the characters in the film. There is really no need to bulldoze through everyone else's sub-plots for a fan favorite. The Loki problem is really the only problem I had throughout the entire film and if that's it, I say that ain't bad. Everything else in the film is grander and so much fun that I couldn't help but like this movie a lot. Thor was going to be one of Marvel's trickier characters to bring to life, but these two movies are proof that it can be done. With bigger action pieces and great acting, what else can you expect from a superhero movie? But overall, this was definitely a Thor movie and you can't argue with that. My favorite part was no doubt the mid-credit scene. Because I knew who Benicio del Toro was playing and I know all about the Infinity Stones. As excitement washed over me and I began to form theories and possibilites for the rest of Phase Two and into Phase Three, it was relentlessly exciting. And I smiled as I sat there aw-struck afterward while everyone around me shrugged and said "that was confusing." I love being a geek! More heroes will be in "Batman vs. Superman"